BERKELEY, CA � Fume hoods, devices that are widely used by high-tech industries, hospitals and universities, help keep workers safe but can use a lot of energy -- a single fume hood running 24 hours a day uses as much energy as an entire house. New fume hood technology developed by researchers at the U.S. Department of Energy�s Lawrence Berkeley National Laboratory reduces energy use by 50 percent or more. This technology has been demonstrated successfully in testing at Berkeley Lab and at the University of California, San Francisco�s Department of Pathology. 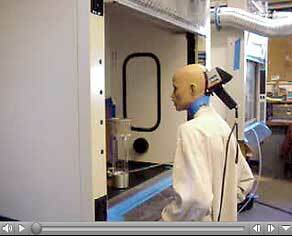 There are an estimated 85,000 fume hoods in California, and more than 500,000 in the United States. Berkeley Lab researchers estimate that the new technology could save 360 gigawatt-hours (GWh or billion watt-hours) of electricity in California, and 2,100 GWh in the United States. At $0.08 per kWh, the annual electricity savings per hood is about $1,000 (close to 8,500 kWh saved per hood). "This invention improves user safety while reducing both energy use and the size of mechanical systems required to provide adequate heating, ventilation, and cooling," said Berkeley Lab�s Dale Sartor, one of the fume hood�s developers and Head of the Environmental Energy Technologies Division�s Applications Team. The prototype high-performance fume hood installation at UCSF�s Scanning Electron Microscopy & Cardiovascular Structure Lab is the first in a working lab in California and one of two prototypes currently in testing in the U.S.
"We are thrilled with the success of this field test," Sartor said. "We are working with industry partners to continue the development and refinement of the technology." He added that before the new hoods can be applied commercially, institutional and regulatory barriers also need to be overcome. Fume hoods are ubiquitous in industrial, medical, and university research facilities. They are box-like structures often mounted at tabletop level with a movable window-like front called a sash. Fume hoods capture, contain and exhaust hazardous fumes created during industrial processes or laboratory experiments. Generally, fumes are drawn out of a hood by fans through a port at the top of the hood. Pharmaceutical and biotechnology facilities have hoods, as do facilities ranging from industrial shops, to medical testing labs, university research labs, and high school chemistry labs. "Fume hoods typically require large exhaust flows and are usually never turned off, so they use a tremendous amount of energy both in fan power and in heated and cooled room air," said co-developer Geoffrey Bell. "The hood could save typical industrial facilities hundreds of thousands of dollars a year in energy costs." Hood use is growing rapidly in California. Besides biotech and high tech, universities and colleges are building labs to keep up with the demand for science education. Hoods contribute to the high energy cost of these buildings -- often four to five times more expensive than offices. A typical fume hood, with a sash opening six feet wide and two to three feet high, circulates air through this sash at 100 feet per minute. The energy to filter, move, cool or heat, and in some cases scrub (clean) this air is one of the largest loads in most lab facilities. The Berkeley Lab design uses small supply fans located at the top and bottom of the hood�s face, to push air into the hood and into the user�s breathing zone, setting up a "divider" of air at the sash. The air divider helps prevent fumes from reaching a user standing in front of the hood. Consequently, the exhaust fan can be operated at a much lower flow. Current research has reduced the flow to 30 percent of a typical hood installation. Because less air is flowing through the hood, the building�s environmental conditioning system can be downsized, saving both energy and initial costs of construction. The high-performance technology was developed by Helmut Feustel and Bell. Additional members of the team are Sartor, Chris Buchanan, Darryl Dickerhoff, William Fisk, and Doug Sullivan. The demonstration and field-testing of the high-performance fume was funded by Pacific Gas & Electric. Research and development of the technology was supported by the U.S. Department of Energy, the California Energy Commission, and the California Institute for Energy Efficiency. Labconco Inc. of Kansas City, Missouri, provided the fume hood, Siemens Building Technology, Buffalo Grove, Illinois, the control and monitoring system, and Marina Mechanical, the installation. UCSF provided significant cost-sharing and in-kind support. The Berkeley fume hood has a patent pending. For more information, contact Berkeley Lab�s Technology Transfer Department, [email protected], (510) 486-6467. Berkeley Lab is a U.S. Department of Energy national laboratory located in Berkeley, California. It conducts unclassified scientific research and is managed by the University of California.